Growing up I thought chili came from a can. My mother was a great cook, but never made chili. It wasn't until I became a vegetarian and started making bean chili that I knew that great homemade chili was possible. My husband on the other hand loves chili. He also has definite opinions on how it should taste. When we first got married I really only knew how to make bean chili, which I quickly learned wasn't going to cut it with my meat loving husband. So I started trying to learn to make chili with meat. Luckily the town that my family and I live in has its very own chili fest in the early fall and there have been many people that have helped me to perfect my chili cooking. Now I consider myself a proficient chili cook. Last week I was in the mood to experiment with a new chili recipe and prepared the State Fair Chili from Saveur magazine. This recipe has 12 ingredients. It takes 2 hours and 15 minutes and makes 8 servings. As I do with all ground beef recipes I ground my own beef. I highly recommend this extra step. There is no comparison in taste and texture to home ground beef, it is so much better than store bought. To crush my tomatoes by hand I place them in a plastic bag, seal it and then crush them between my figures. I followed the remainder of the recipe as written. Homemade chili is really delicious. 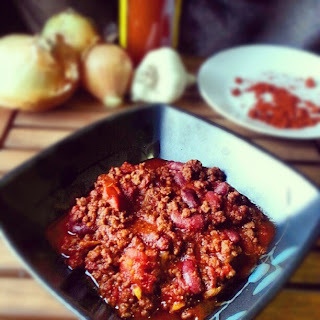 This recipe is easy to follow and the chili has a great taste. I like that it is simple and lets the ingredients speak for themselves. Make sure to add enough salt to adequately season the chili. When seasoned adequately this chili recipe is delicious, simple and I would definitely make it again. For the recipe go to State Fair Chili. Thanks :) If you end up trying it tell me how it turns out!